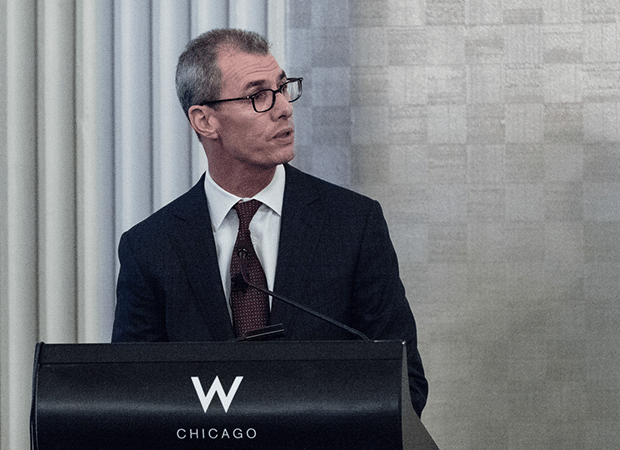 As part of Citadel’s speaker series, which brings the firm’s team members face-to-face with icons in business, technology, and beyond, Adam Cooper, our Chief Legal Officer and lifelong Cubs fan, spoke with the Cubs’ Theo Epstein and Joe Maddon. The conversation soon turned to something both care a lot about: developing talent. Now, I was struck at the end of last season when you traded Starlin Castro. At that point you had turned over 100 percent of the roster you inherited. So getting the right people on the bus is clearly something you’re thinking about. Are there any lessons you’ve learned in terms of developing personnel and getting those players up the curve? Theo: I think it starts with an honest assessment of where you are, what are your strengths, and what areas does your organization need to focus on for development. From that assessment, you implement a process for improvement. When I look back at the moves that didn’t pan out, there’s a theme. We got away from our process. If we have a bad outcome but a good process, I’m fine with what happened. And I think that sentiment applies in financial services. The process is more important because it’s repeatable and controllable. Outcomes will come and go. But when we try to speed things up or talk ourselves into something that’s not consistent with our process that’s when we make mistakes. But overall, we’ve been pretty single minded. For three straight years, we were all about acquiring exceptional young talent, and everything that we wanted to do had to fit into that paradigm.